As regular visitors will know, I am a keen enthusiast of paintings from the glorious Georgian era. I am far from an expert but can happily lose hours studying the work of the era, hopefully learning one or two things along the way. My knowledge of sculpture is somewhat more lacking but today it is that medium that draws my interest, as we take to a trip to Westminster Abbey to mark the anniversary of the unveiling of a hugely impressive monument. On this day in 1762, three years after the death of George Frideric Handel, Louis-François Roubiliac's breathtaking sculpture of the composer was finally revealed. 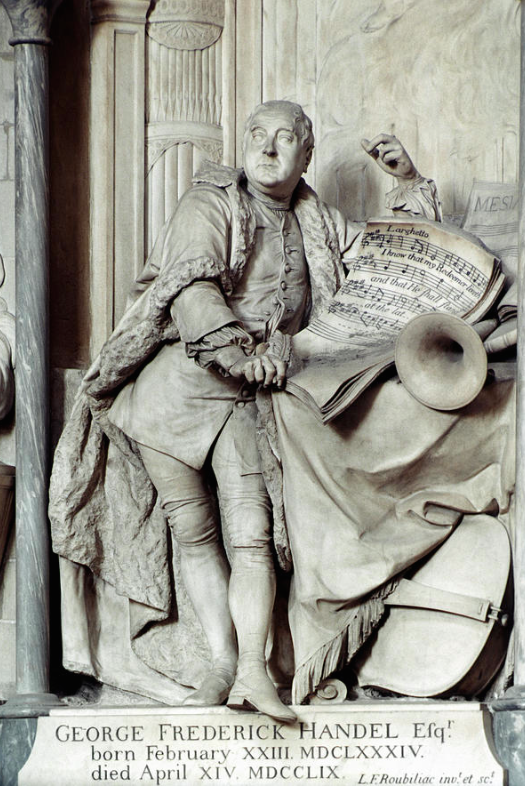 Roubiliac had sculpted Handel more than twenty years earlier as a commission for Jonathan Tyers, the owner of Vauxhall Pleasure Gardens but whereas that was a somewhat casual depiction of the composer, the Westminster Abbey work was to be far more formal. The life-size statue shows a finely-dressed Handel among heavenly clouds, accompanied by angels and with a copy of the Messiah score in pride of place. An ornate organ and other instruments are also part of the scene, making the clear point that, even in heaven, Handel would not be kept from composing. The statue is positioned above Handel's final resting place and was modelled from the composer's death mask, so we can be sure that it is an excellent likeness. This stunning funereal monument was created thanks to a specific point in Handel's will in which he asked that he be buried in Westminster Abbey, with a monument erected to his memory. I think he might have been pleased with the result! Thank you,Madame for making the link back to Jonathan Tyers and to your favourite haunt of Vauxhall-and so to the other famous Handel bust. It is always a pleasure to visit Vauxhall!